There is currently a flurry of activity surrounding the potential finding of the remains of General Draza Mihailovich in Serbia. General Mihailovich, Supreme Commander of the Yugoslav Army in the Homeland (JVUO) during World War II and leader of the Ravna Gora freedom fighters against the Nazis and the Yugoslav communists, is a controversial and legendary figure in world history. Much has been written, both true and false, about his WWII military career and life. Very little is known, especially in the English language, about his pre-WWII military career and first 25 years of life. Those years shaped the man and future Supreme Commander and his personal history is a noble one. This is the story of the first 25 years in the life of General Dragoljub-Draza Mihailovich. ﻿In Ivanjica, Serbia, a beautiful town of rolling hills 200 kilometers south of Belgrade, was the home of Mihailo and Smiljana Mihailovich. Mihailo was a district clerk and Smiljana was a housewife. Both Mihailo and Smiljana prayed to God day and night to be blessed with a son. God and nature answered their prayers and on April 27, 1893 a son was born to them. They named him Dragoljub, meaning “dear love” and gave him the nickname of “Draza”. His father would call him the “Avenger of Kosovo”, referring to the pivotal battle in Serbian history of 1389 when Serbia lost her entire army of 70,000 men defending Christianity against the onslaught of the Ottoman Turks and Islam. But even as Draza was born his father was a very ill man. He had contracted tuberculosis, and his doctor suggested he stay away from his young son as much as possible. Two daughters, Milica and Jelica were born in 1894 and 1895 respectively. Two years after his beloved son was born Mihailo died. Smiljana took as good care of their young son as she could, but she herself was not in the best of health. TB was a contagious, potentially fatal illness and, at the time, there was no cure or preventative treatment. Draza lost his mother when he was only seven years old, and he became an orphan as a very young child. Thus, Draza Mihailovich learned tragedy and loss very early in his life. Despite these tragic circumstances, Draza was fortunate. He had three Uncles. 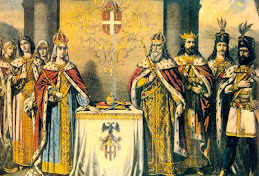 Two of them were military officers and one was chief of the Telegraph of Serbia. One of the Uncles, Major Vladimir Mihailovich, who was a veterinary doctor in the army, brought Draza and his two sisters to live with him in his home on Studenicka Street in Belgrade, the capital city of Serbia. Living with him was Draza’s paternal grandmother, Stanica. It was a pleasant new home for Draza and his sisters. The year was 1901, just as the world was entering the new century. 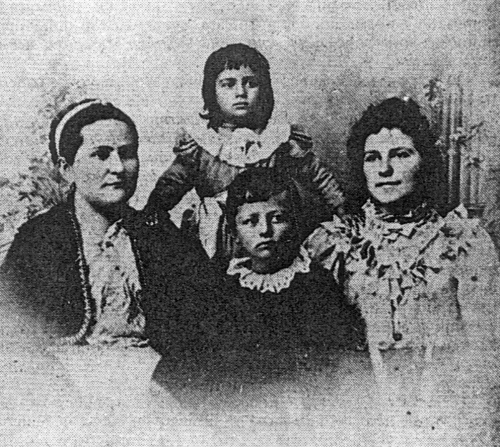 Unfortunately, Draza’s sister Milica, like her parents, contracted TB and died very young in 1905. In 1904 Draza completed grade school in Belgrade, becoming a good student early in his academic life. ﻿As the world entered the 20th century, many changes were brewing. Some for the better some for the worse. Draza’s beloved Serbia, as well as the other Serbian lands in the Balkans would be in the center of some of those pivotal changes. Serbia would go through one of the traumatic changes that Draza was old enough to experience while he was still in grade school when King Aleksandar Obrenovic was assassinated and quickly replaced by Petar Karageorgevic in 1903. The transition turned out to be a positive one. 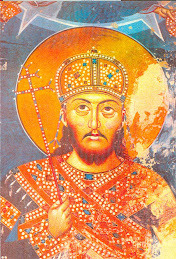 King Peter I, the new king of Serbia, would become one of the most beloved royal hierarchs in all of history. 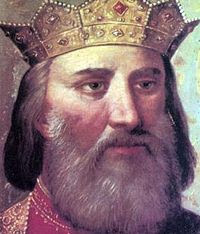 The new king had to repair the damage created by the assassination and did so fairly quickly, pronouncing that Serbia under his rule would be a constitutional monarchy and parliamentary democracy. He kept his word. A more settled life in Serbia began. There was a lot of progress on all levels in Belgrade itself. Young Draza was old enough by this time to experience all of this excitement. Even while he was still in grade school watching his Uncle dress in his military uniform every morning impressed Draza tremendously. It instilled in Draza’s heart and mind a desire to become an officer in the Serbian army. During his high school years Draza would become very religious. He loved the military greetings used by the Serbian army. Officers greeted soldiers with “God be with you heroes” (“Pomaz Bog junaci”) and the soldiers answered with “God help you” (“Bog Ti pomogao”). He would also become an exemplary student. From a very early age Draza wanted to establish his independence. It bothered him that his Uncle had to support him. That was one reason he put extra effort in all of his studies and it was, more than anything else, what made him an outstanding student. Draza’s first real test as a military officer was to come shortly after his promotion to sergeant-cadet. In 1912 Mihailovic was forced to leave the military academy and join the regular army on the battlefield as the First Balkan War broke out in October of 1912. He was assigned to a regiment stationed in Uzice in western Serbia, fifty kilometers from his birthplace in Ivanjica. He used that opportunity to visit his first home. He found it empty. The garden next to the house that his mother had loved to work in was overgrown with weeds. Even the path that led to the entrance of the house was overgrown with weeds, indicating that no one had been around for years. This saddened Draza, but he couldn’t dwell on it. His mind was occupied with the coming war against the Ottoman Turks. They had kept the Serbs under Islamic subjugation for 500 years and the time had come to chase them out of Serbia and out of the Balkans for good. The time and opportunity had indeed come, as his father had predicted many years before when his son was born, for Draza and his generation of Serbs to avenge Kosovo. Draza’s regiment moved south to the area where a major battle with the Turks was to take place that was to become part of Serbia’s long, magnificent history. The area was Kumanovo in Macedonia, in the northern part of the Macedonian region. United with the Serbs in this battle were the Greeks, Bulgarians and Montenegrins. At the Battle of Kumanovo on the 23rd and 24th of October of 1912, the Serbs destroyed a good part of the Turkish army and it was just a matter of time before the Serbs were free of Ottoman rule after five centuries and Christian Kosovo was theirs once again, where it belonged. A series of significant battles followed in Bitola, then in Edirne (the Battle of Adrianople or “Bitka za Jedrene”), and the Serbs, along with their Balkan allies, were victorious against the Ottoman Empire in all of them. The Serbian commanders in the First Balkan War battles - Crown Prince Alexander, commander of the Serbian First Army; Stepa Stepanovic, commander of the Serbian Second Army; Chief of the General Staff Radomir Putnik and Petar Bojovic, both commanders of the Serbian Third Army, all distinguished themselves. 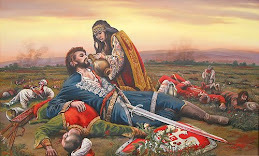 Of all the battles fought in the First Balkan War, the most important victory for the Serbs would be the return of their sacred Christian Kosovo to Serbian hands, and Draza Mihailovich was a part of that. 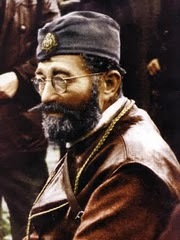 In the October 1912 battles with the Turkish forces, Draza’s first real battle experience in war, Draza showed himself to be a very brave soldier, participating in the most difficult confrontations at the Pcinja River, a river shared between Serbia and Macedonia, and Nagoricino in Macedonia. As a result, he would receive his first military decoration, the Silver Medal for Bravery, and was promoted to the rank of Sergeant. The Silver Medal of Bravery would be his first in a series of decorations that he would receive throughout his military career and beyond. The decorations Mihailovich would earn would not just be issued by the Serbs but by the British, the French, the Bulgarians, the Czechs and the Americans. He would go on to become one of the most decorated soldiers and officers of the Serbian and later the Yugoslav Army. On May 30, 1913 the First Balkan War officially ended, and the Turks had effectively been driven out of southeastern Europe. Peace, however, was tenuous. With the Ottoman Empire vanquished from the region, there was now to be a power struggle over how the region would be partitioned and who would get control over what territory and its peoples. The Great Powers of Europe had a vested interest in how things would be divided among the smaller powers and would consequently provoke the smaller powers to go to war once again, this time against each other. Austria-Hungary most certainly did not want a strong Serbia to emerge from her victory in the Balkans. 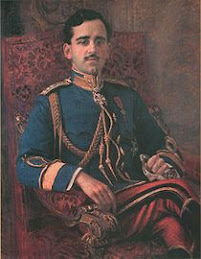 Bulgaria, unsatisfied with her share of the victory, was prodded by the Dual Monarchy to go to war against Serbia, her former ally in the war that had just ended. Official peace in the region would last only one month. On June 29, 1913 the Bulgars attacked the Serbian positions at Bregalnica in Macedonia, thus beginning the Second Balkan War, but the Bulgarians were soundly defeated. 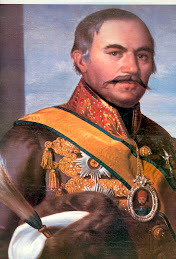 Draza’s Fourth Regiment fought on the front from Stracin to Kriva Palanka. Then he was transferred from the Danube Division second line to the Morava Division second line. He participated in the battles on the Zletovica River and then at Kocani in Macedonia where Draza Mihailovich would sustain his first war wound. 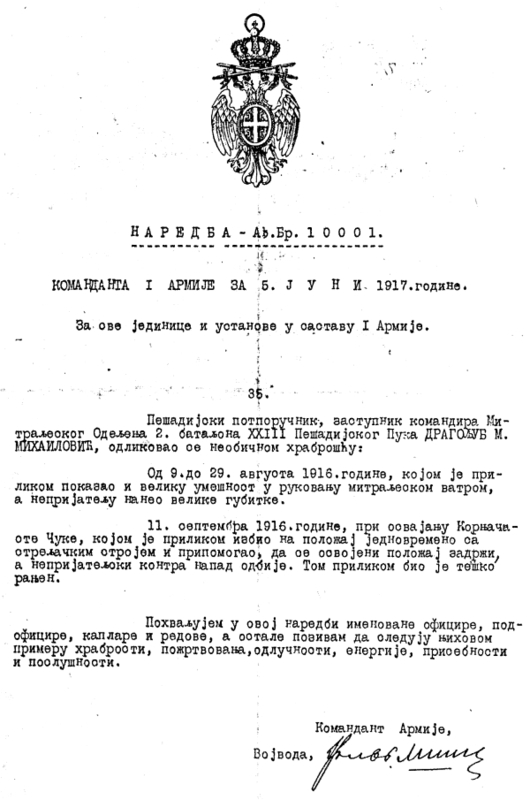 On July 18, 1913, when the armistice with Bulgaria was signed with Bulgaria defeated, Draza was promoted to the rank of Second Lieutenant. He was 20 years old. 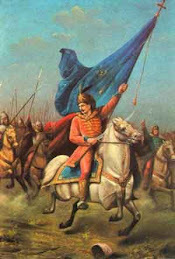 After the Second Balkan War ended Draza was transferred to Kosovo with his unit to quell the Albanian rebellion there. The Albanians were penetrating into Serbian territory and threatening Serbian civilians who needed protection. In January of 1914 the 43rd class returned to the Military Academy. Draza Mihailovich completed his studies and graduated fourth in his class. His scheduled plans to continue on his military career path would be interrupted. Another war was on the horizon, and what was looming was more frightening for the Serbs than anything that had come before. They had lost so many men in the two Balkan wars, had expended their ammunition, and the economic situation in the country was very difficult. As frightening as the prospect of war with the great Austro-Hungarian Empire of over 50 million people against the small Serbian kingdom of less than 5 million people was, no one could imagine what it would eventually turn into. Draza was mobilized for battle once again in July of 1914 and assigned to the Third regiment of the Drina division, which put him in the first line of battle when the Austrians attacked Serbia in August of 1914. The very first Allied victory against the Central Powers in World War I would be fought and won by the Serbs at the Battle of Cer that August. Draza Mihailovich was there. But there were two more great battles to come before the year ended. The Austro-Hungarians, temporarily driven back, would return in September. When his company commander, Captain Cedomir Stanojlevic was wounded on September 9, Draza substituted for him. The battle with the Austrians on the Drina River was very bloody, but Mihailovic came out of the second great battle of 1914 unscathed. The Serbs were victorious and pushed the Austrians back over the river. As the third confrontation, the crucial Battle of Kolubara of November and December 1914 was developing Draza was in the midst of it. There was fierce fighting on October 24th and 25th at Kostajnik and on November 7th at Plandiste. Although his battalion withdrew, Draza Mihailovich remained on the battlefield. 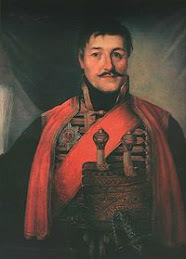 He participated in the defense of Majdanpeksa Glavica and in the battle to recapture Valjevo on November 26. Once again, Draza Mihailovich proved himself to be a very brave soldier. For his bravery, on the recommendation of Major Ljubomir Djordjevic, Mihailovich was awarded the Gold Medal for Bravery. Draza Mihailovich had the kind of bravery that was required in the Serbian army, an army of 400,000 men up against an enemy force of almost 2 million. 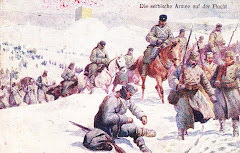 With the Austro-Hungarian Army defeated by the Serbs in December of 1914, it was relatively quiet on all fronts in the Serbian lands for 9 months. The peaceful time would not last. The Central Powers would come back with a vengeance in October of 1915. This time the Austrians would be joined by the Germans and the Bulgarians under the command of Field Marshal August von Mackensen. The attack was brutal and overwhelming for the Serbs this time. The Central Powers struck Serbia from the north with 600,000 men and from the east with 400,000 men. The Serbs would fight back heroically, but they were no match for the combined enemy force. The British and French did not participate in helping their ally. Serbia was alone. Draza fought bravely at Pozarevac where his father had been born, and soon after this he was made a platoon leader, but he would have to leave his beloved Serbia, as this time the onslaught was too much even for the bravest of men. To save the army, and thus the nation, the Serbian Supreme Command had no choice but to retreat south in the hope of meeting up with the French and British who had established a new southern front in Salonika, Greece. But the Bulgars, with their nearly half-million man strong army, attacked Serbia from the east and cut off the southern route to Salonika. As a result, the Serbian Army was forced to retreat through the rough Albanian and Montenegrin mountains at the worst possible time of year. The elements they faced were snow, ice, and freezing temperatures that descended to 25 degrees below zero Celsius, conditions which they were not adequately prepared for. To secure the army reserve the Command mobilized 30,000 boys of Serbia from 12 to 18 years of age. 350,000 soldiers and civilians participated in this survival march, enduring the most difficult weather conditions and terrain and the inevitable starvation, but only 150,000 would reach their destination. Draza was among them. Many, so many, died along the way. Draza Mihailovich survived. 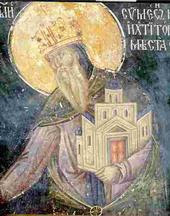 Draza’s line of retreat was Pec-Berane-Podgorica-Skadar. With him his platoon had taken the four machine guns they had captured from the Austrians. Draza finally reached Vlore, a small Albanian port in southwest Albania, at the end of December 1915. It was a miracle that his platoon still had all four machine guns with them as many of the other soldiers discarded their weapons, finding it impossible to carry them through the ice and snow of the Albanian and Montenegrin mountains. 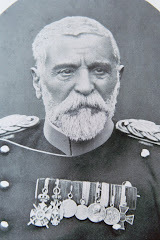 Here he stayed as a protective force as other Serbian units were slowly reaching the Adriatic coast. Along with the harsh weather conditions, the difficult terrain and starvation, the Serbs became targets of Albanian thugs along the way who attacked ruthlessly when the Serbs were at their most vulnerable. 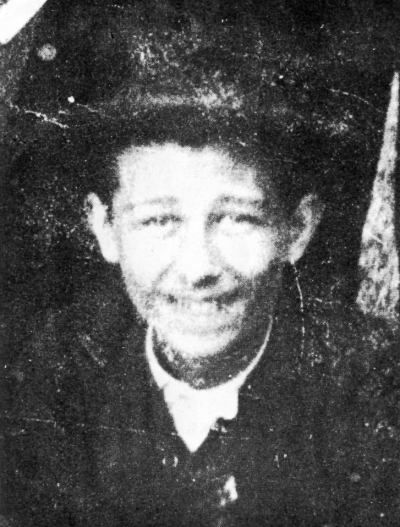 On February 9, 1916, being among the last to leave the mainland, Draza was transported to the small Greek island of Corfu, exhausted and underfed, where he stayed until April of 1916. When the Serbian army reorganized and resurrected itself on Corfu, Draza was assigned to the 2nd battalion of the 23rd regiment of the Vardar Division. He would reach the Salonika front in May of 1916. The first serious struggle Draza participated in after he reached the Salonika front was part of the legendary battle of Kajmakcalan mountain. On September 11, 1916, on a battlefield near the village of Donje Vrbine and Neokazi, Draza was seriously wounded and transported to the Salonika hospital where he was forced to recuperate. In the mean time, Serbs did capture Kajmakcalan on September 30, 1916, thus regaining some of their occupied territory. Of note, Second Lieutenant Mihailovich, due to his injuries and his rank, was made the offer to serve off of the battlefield however he did not accept this offer. 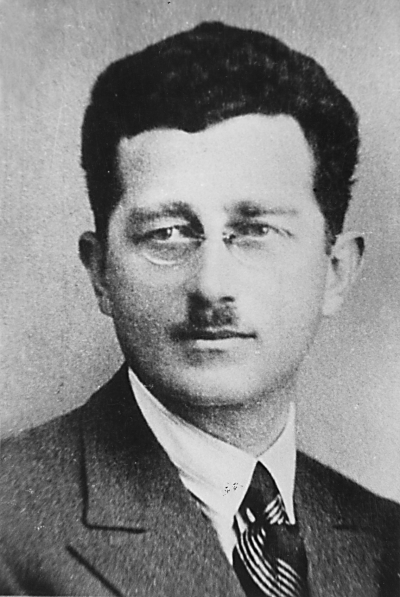 Against medical advice, Draza returned to the front line on his own in early April of 1917 and participated in the battles at Ostrovo Lake, Gornicevo, Ziove, Sokolac, Zeleno Brdo, Govedar Kamen and Dobro Polje. ﻿On the surface, 1917 was a relatively quiet year, with many skirmishes but no significant battles between the forces of the Central Powers and the Allies. Attention turned to the entry of the United States into the war on the Allied side in April of that year. Attention then turned to what was happening in Russia where the cataclysmic Bolshevik revolution was taking center stage, which would take Russia out of the war. The new 1st Yugoslav infantry regiment of the Yugoslav Division was established at the beginning of 1918 and Draza’s machine-gun platoon was transferred to it. It would be with this division that he would participate in the great breakthrough at the Salonika Front in 1918. While on the Salonika Front, Draza Mihailovich was further promoted and decorated for his merits and bravery. He was promoted to Lieutenant on January 25, 1918. He would receive another Gold Medal for Bravery, the British Military Cross, and the Order of the White Eagle with Swords IV degree. There would be more awards to follow. The most significant Serbian action of the First World War was yet to come. Ever since they had arrived at the Salonika Front in 1916 after their rehabilitation on Corfu, the Serbian Supreme Command had insisted on initiating a major action on that front. The Allies were reluctant to agree. They considered the Western Front as the only one where a major, decisive victory over the Central Powers was possible. 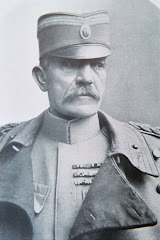 It was only when French General Louis Franchet d’Esperey became the Commander of the Allied Eastern Armies which included the Serbian forces on Salonika Front that things started moving in the right direction. He had spent time in the Balkans as a young officer, and he understood the people, their culture, and their dreams. He especially understood the Serbs. Like them, he believed that a breakthrough on the Salonika Front would decisively break the back of the Central Powers, resulting in cutting the war shorter than predicted by other Allied leaders and commanders. On average, five million people, both military and civilian, were dying each year of this war so far. Thus, shortening the war meant saving over 13,000 human lives each day that the war was cut short. But the other Allied leaders as well as the leaders of the Central Powers were anticipating and planning for the war lasting another year and maybe longer. Some even predicted it would last until the summer 1921. At the end of June 1918 the Allied Supreme Command in Paris did finally approve a major action on the Salonika front as the Serbs and d’Esperey had demanded. The first thing the French general did was to request 1,500 heavy cannons which the Serbs had asked for and when the cannons arrived, the Serbs, with the help of their animals, pushed them up into the hills to a position from where they could reach the first line of the enemy defense. Very early in the morning of September 14, 1918 these cannons began firing and kept doing so all that day. At 5:30 on the following morning, September 15th, the Serbs began their assault on the Central Powers and the epic battle on the Salonika front known as the “Battle of Dobro Polje” began. 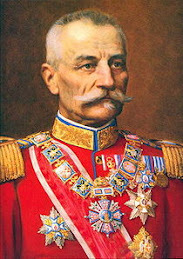 Attacking first was the Serbian First Army under the command of General Petar Bojovic. When the French divisions collapsed around noon that day the Serbian Second Army under the command of Field Marshal Stepa Stepanovic, which was intended to be a reserve, entered the battle. The breakthrough on the Salonika Front was successful, the Serbs were victorious against the Bulgarian forces, and it was the beginning of the end for the Central Powers. The end of the war would come less than two months later, thereby ending the massive attrition of lives that could have gone on indefinitely had there been no such breakthrough on the Salonika Front. 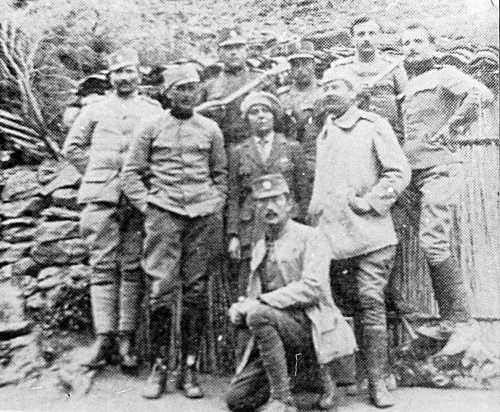 That September of 1918 Draza Mihailovic was part of the Serbian Army that participated in the breakthrough on the Salonika Front. 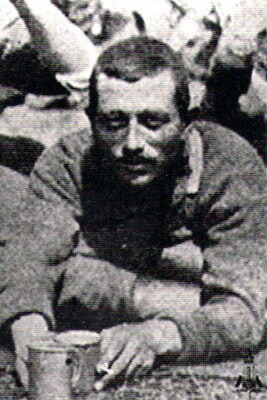 He fought at Dobro Polje, Kozjak, Konopiste, Kavadarci, Gradsko and near the village of Dragovo (near Stip). 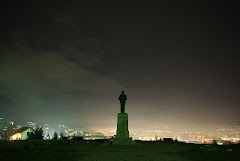 On Kozjak, which was the main defense point of the Central Powers on the Salonika front, Draza saw thousands of dead bodies of Bulgarian soldiers all around him. It saddened him, because Bulgars were Christian Orthodox Slavs. They should have been the Slav brothers and allies of the Serbs, but they weren’t. They submitted to the tutorship of Austro-Hungary and Germany. For that, both the Serbs and Bulgars paid a horrible price. There on the Salonika Front, on Kozjak mountain, a new life would begin for him. He was 25 years old. 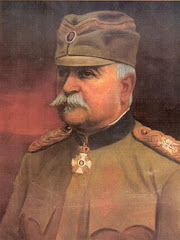 He was not fortunate enough to enter his beloved Belgrade with the victorious Serbian army on November 1, 1918. After the breakthrough on the Salonika front his unit was again sent to the Albanian and Kosovo border to protect the Serbian civilian population under attack from Albanian armed criminals. While still a young man, Draza Mihailovich would become one of Serbia’s most decorated soldiers and officers, a true hero of Serbia. An excellent student in the classroom would excel on the battlefield where real life scenarios of war and survival would test him over and over again in three successive wars that he participated in with distinction. As the First World War ended he could not have known that the biggest tests of his life as a soldier, as an officer, as a patriot, as a Christian and as a man were still to come.